Obituary – Dykes, Leslie Eugene « Perry High School Alumni Association, Inc.
– son of Mr. and Mrs. J. O. Dykes, was born May 22, 1918 in Noble County, Oklahoma. All his school days were spent in the Perry system. He participated in the typewriting contest at Tonkawa in April of this year. He expects to work in Perry at the Dykes’ filling station next year. Leslie Dykes, 51, of Clinton, former Noble county deputy county clerk, died at 5 p.m. Sunday at his home of a heart ailment. Dykes had open heart surgery Jan. 6 in Baptist Memorial hospital, Oklahoma City. Services were pending Monday in Clinton. A graduate of Perry high school, Dykes was born southeast of Perry. On May 14, 1938 he and Alice Gross were married in Tillman, Oklahoma. 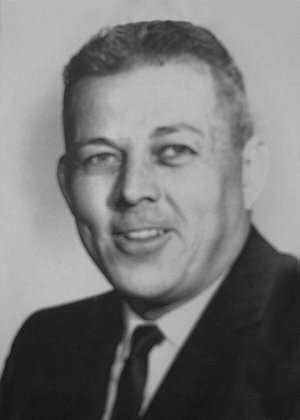 He served as a deputy Noble county clerk in 1940-42. He moved from Perry in 1942 to Clinton, and had worked since then as Frisco Railroad depot agent. Survivors include his wife, Alice, of the home; two daughters, Mrs. R. B. Graft, Leedey; and Mrs. Charles Lacy III, Abilene, Texas; his mother, Mrs. J. O. (Mollie) Dykes, a patient at Green Valley Nursing Home here; and two brothers, Haskell, Enid; and John, Perry.